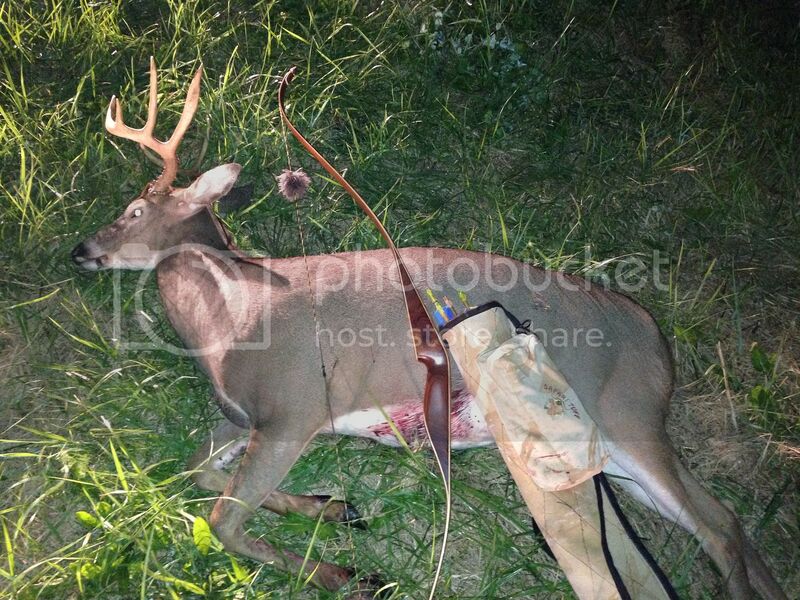 I'll start... lol... :-) I shot this guy at 10 yards Opening Evening. Watched him all week the week before season, I went in set up where he was coming into the field, I misted a little Doe Pee and about 15 minutes later he came running in from down wind, stopped 10 yards infant of me, slightly quartering to and with a perfectly placed arrow by the hunter(:-) he went maybe 75 yards! I'm stoked! Good luck everyone and be safe! 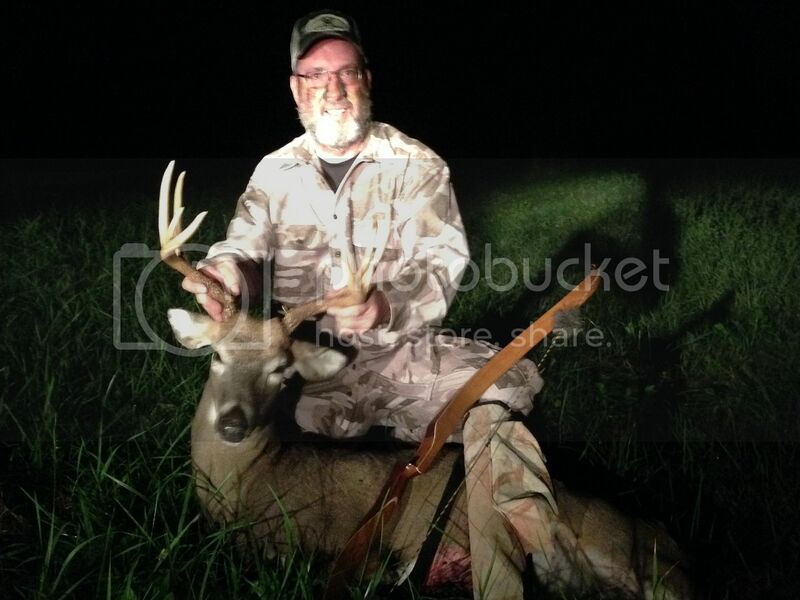 Congrats Joe, very nice buck. WAY TO GO Joe!!!! Congratulations!!! A blind squirrel does in fact find a nut once and a while. That was the case as luck was on my side on opening morning. With the full moon on Friday it was still fairly high as the sun was coming up Saturday morning. The skies were clear to the west and overcast to the east so it was one of those rare mornings where the transition from bright moonlight to daybreak is undistinguishable. So as the day was starting I stood up in my stand to prepare for what might come my way a few minutes before opening. After standing for about ten minutes I turned my head to the right just in time to see a buck approaching on the trail 15 yards in front of my stand. He stopped with his vitals behind a tree and started to work over the overhanging leafed out branch. After about a half minute I got turned to face him and he paws the ground twice and takes a couple steps clearing the tree but now angling towards me. In the low light it was tough to see very many details of his rack. 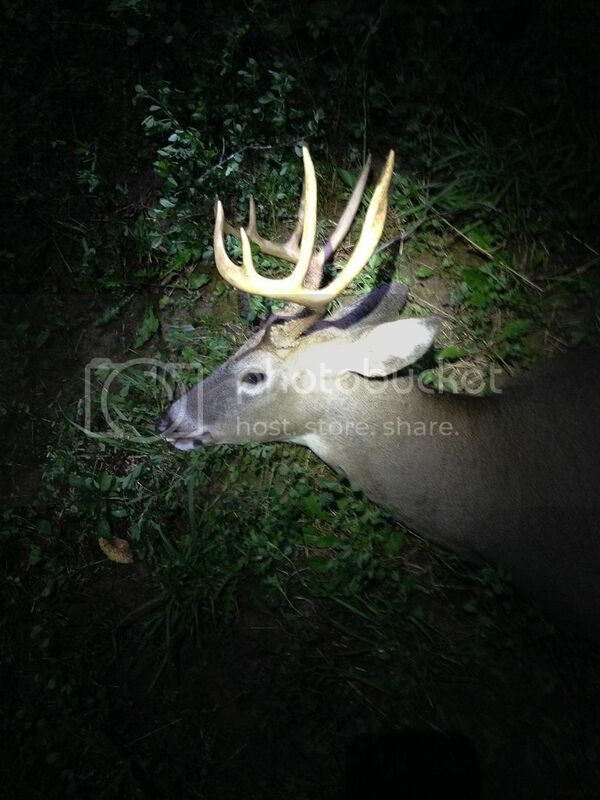 His long tines stood out and when he faced me I could see the spread and some significant mass. I had to make a decision fast on whether to try and fill my tag this early in the season and decided that he would fulfill my requirements of a shooter. Turning back on the trail he moved slow as I came to full draw but the clump of leaves in front of me were of concern. The shot just did not feel right. As he passed by another tree he entered the spot that would be my final chance to get off a shot and the arrow was on it’s way. The illuminock made it look like a green laser right to the center of the chest. He took off to the south running straight away from me along the side of the corn field. His tail was tucked tight and at about 75 yards away he stopped broadside and looks back my way. After about five seconds he gone but replaced by a big white spot on the ground just in front of the spot he stood. Checking my watch it said 6:17, just six minutes after opening. The low light prevented me from seeing details of his collapse. Looking through the binoculars didn’t provide a much better look either. Had he been in more of a hurry and was just walking past me and not stopped at the overhanging branch I never would have even attempted to shoot. There just was not enough light to process everything that fast. Just to be safe I sat to enjoy the morning. After 20 minutes the light was better and confirmed that he was down for good. After waiting ten more minutes I climb down and piece together all that just happened. 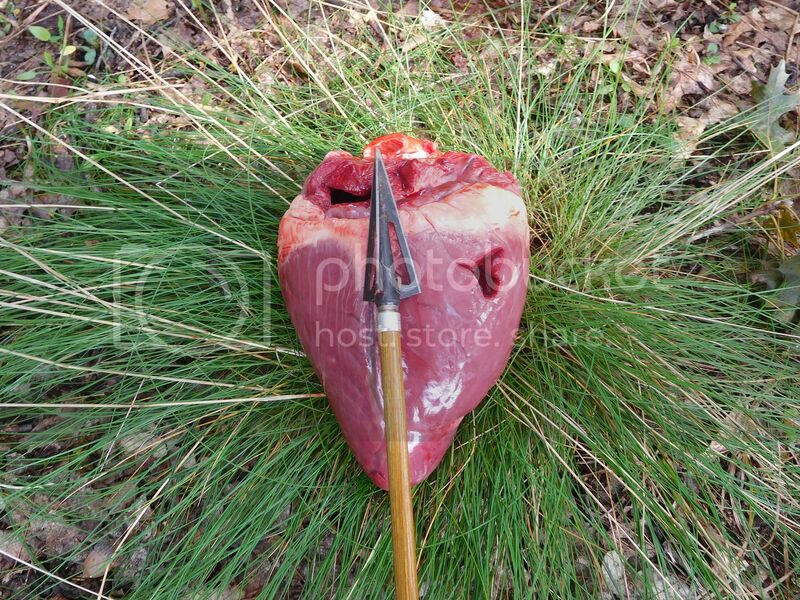 As it turned out the arrow passed through the heart making a very visible blood trail with huge splashes on each bound. 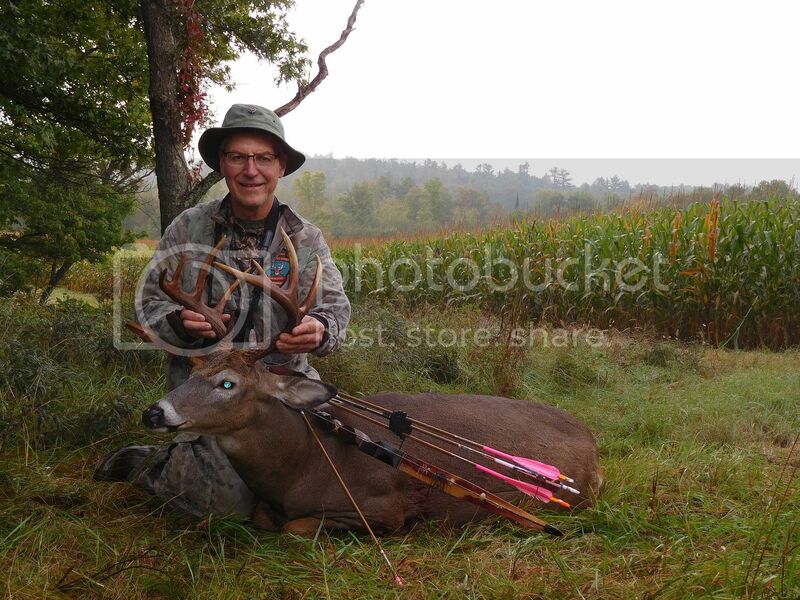 The buck was sporting a 5X5 rack with a 13 ¼ inside spread and weighed in at 165 lbs. I couldn’t have been happier as this is my personal best with traditional gear. The Robertson recurve, Wensel Woodsman broadheads, and Traditional Only carbon shafts had done a super job. On a side note, this stand is essentially the same one that I got my first traditional kill 22 years earlier. That stand however was a ground blind 30yards to the south. On that hunt I used the most miserable longbow know to man (my first build) with mismatched arrows. But I can tell you this much, a fawn at eye level makes them appear much bigger and in fact very exciting. Heart shot as well she came to rest not far from where this buck did. 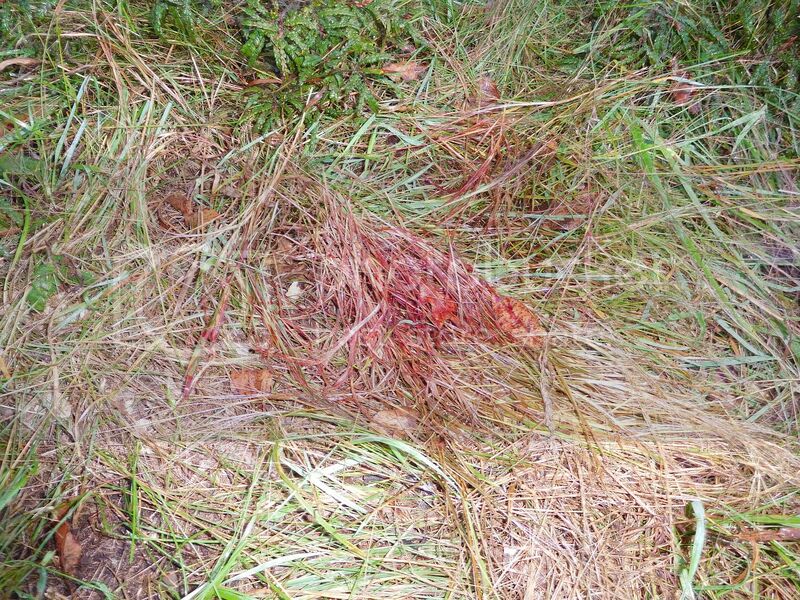 This is what the bloodtrail looked like. That's a dandy Greg, congratulations. Great shot. Well done Greg, what a brute! Congrats brother! Very fine looking animals Joe and Greg. Congrats to you both! Congrats Joe and Greg, Both Fine specimens. Man, some great deer already ! Nice deer! Congrats to Joe b and Greg S . ! 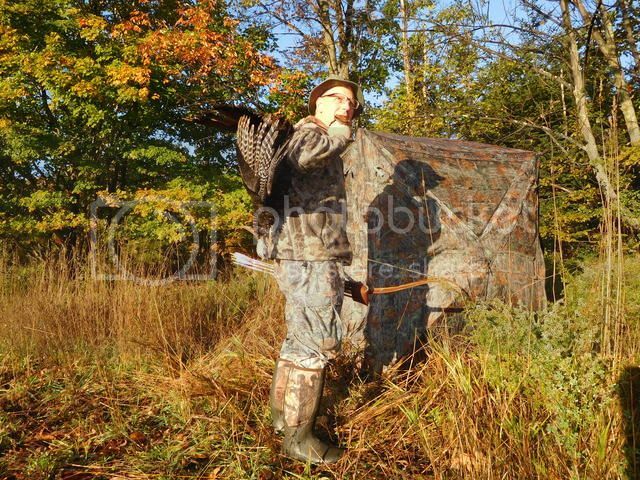 I finally connected on a turkey in Door county after several years of hunting there with Ron Lang. I had the opportunity to hunt Iowa for the first time last week and got my biggest deer with the bow yet there. 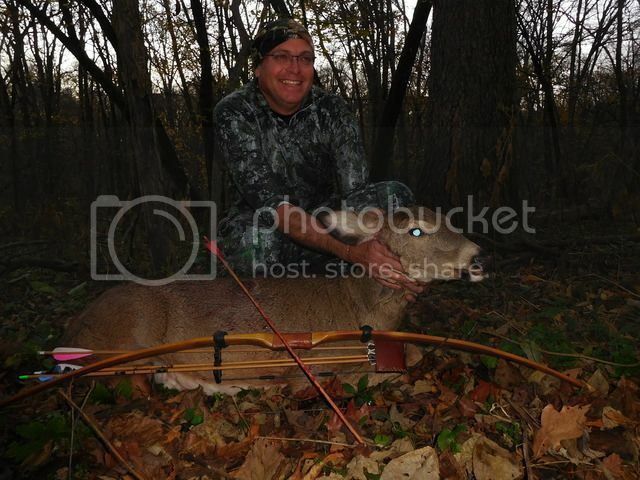 Brian Stallman got this nice doe in Iowa the his first selfbow build.